Slovak Airlines was an airline company offering flights from and to several cities in Slovakia. Cheap flights to Slovakia from UK, for example. The airlines also flew scheduled services from Bratislava to Brussels, Belgium (7 weekly, codeshare with Austrian, Fokker 100) and Moscow Sheremetyevo (4 weekly, codeshare Aeroflot, Fokker 100). After the break-up of the former Czechoslovakia, the Slovak Republic found itself in a specific situation in the area of air transport, in that no transport company remained and even in the past there had never been an effective network of airlines directly connecting Slovakia with the rest of the world. Not a single aircraft or foreign embassy remained in Slovakia. In 1995 the mission of the International Civil Aviation Organisation (ICAO) on a visit to Slovakia proposed the creation of a national air transport company as one possibility of the development of civil aviation. Even before a number of aviation companies had contended for this status, but their efforts had been unsuccessful. After almost one year of intensive discussions experts agreed on the idea that it would be possible to create a strong, high quality airline company in Slovak conditions only in the form of a national airline company. 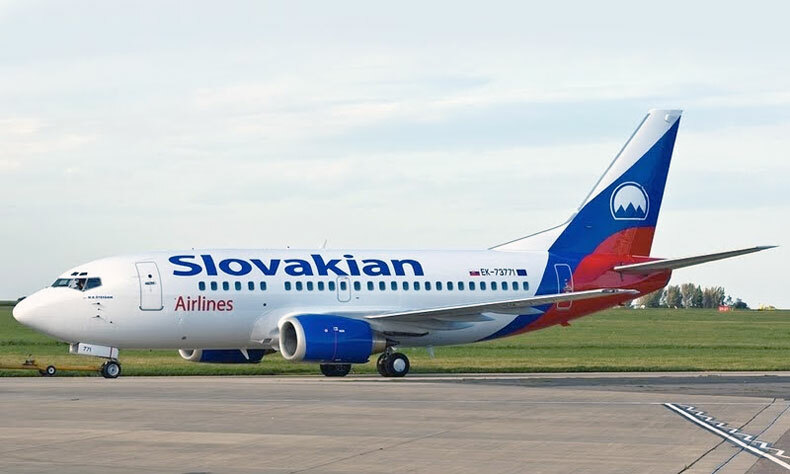 The result of this endeavour was the designation of the company Slovenské aerolínie a.s. [Slovak Airlines, joint stock company] as the national air transport company. The business plan of Slovak Airlines began with the construction of a basic network of lines over a period of 5 years. Within the framework of the Phare programme “Air Operation Safety Improvement”, Slovak Airlines was selected as one of three operators within the states of Eastern Europe as a sample transport company and consultant in the creation of a programme of improving safety of air transport in the Phare countries. The general secretary of the United Aviation Authorities of Europe, Mr. Kouplin highly evaluated the achieved technical standard and capability of the TU-154M aircrafts and invited Slovak Airline to participate in the creation of the prescription basis for the states of the European Commission for civil aviation (ECAC). He evaluated the standard of the Slovak air company according to Western European aviation prescriptions. In 2006 Slovak Airlines j. s. c. obtained financial support from Austrian Airlines, in the total amount of 200 million SKK (about 7 mil. euro). The intention of AUA was to contribute to the realization of Slovak Airlines business plan, with financial support, business experience and know-how. “The Company has been struggling to raisefunds for a long period of time and therefore needs external sources. We started looking for a strategic partner a year ago and we addressed several companies, only Austrian Airlines showed interest,” explains Slovak Airlines spokesman. This process was approved by Slovak airlines majority owner, the Ministry of transport, post and telecommunications. Business activities in the last months were severly affected by not delivering of a small low cost airplane Fokker 100. Slovak Airlines is a small air carrier and delayed delivery complicated the fulfilling of business plan. Fokker operated less popular routes where the operation of larger aircraft Boeing is not cost effective, it is uselessly and expensive. Slovak airlines has been closely co-operating with Austrian Airlines from May 2004. Together they operated regular lines from Bratislava to London, Brussels and Paris. Slovakian Airlines was an airline carier which started operating on 20th of September 2011 when the first airplane of Slovakian Airlines Boeing 737-500 landed at the airport of Milan Rastislav Štefánik in Bratislava. It arrived from Norwich, UK, where it has received new colors of Slovakian Airlines. The aircraft, which previously operated Czech Airlines, is leased from the Armenian airline Armavia. The capacity of the first aircraft has 84 seats in economy class and 24 seats in business class. After obtaining the necessary licenses from December 2011, Slovakian Airlines plans to provide scheduled air services. Slovakian Airlines was a private airline owned by the Slovak entrepreneur Arnold Medzihradský and Mikhail Bagdasar from Russia.